In 1891, James Naismith was a physical education teacher at the YMCA in Springfield, Massachusetts. He was tasked with creating an indoor sport and based the game on duck-on-a-rock . 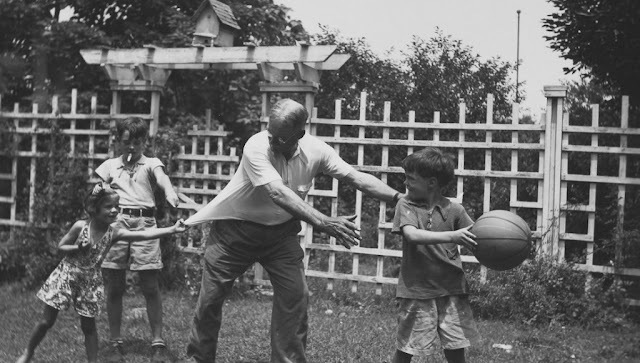 . .
Dr. James Naismith plays basketball with his grandchildren in the backyard. one of those really old kids' games involving throwing rocks at a larger rock . 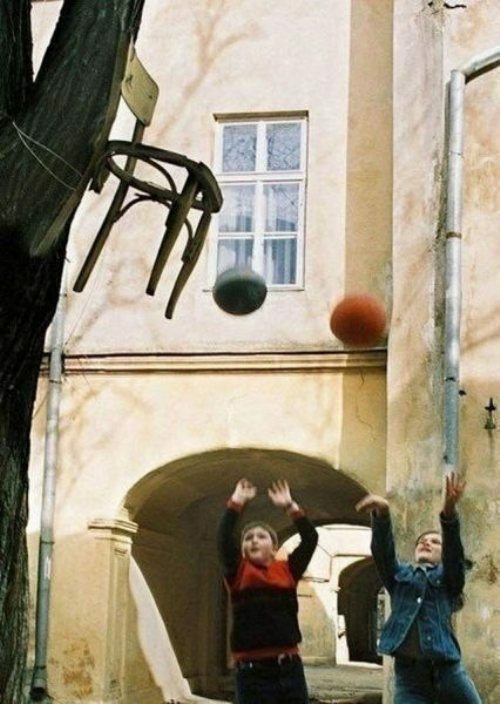 . . he came up with basketball. 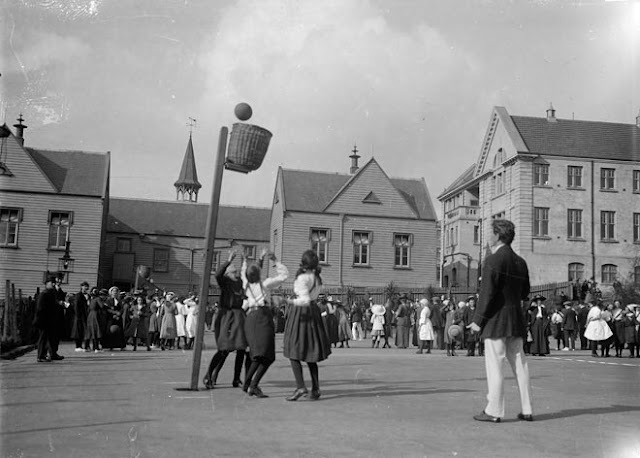 Girls basketball 1910, played with a basket attached to a pole. Originally a fruit basket was nailed high on the wall or to a post, requiring someone to climb up a ladder and retrieve the ball after each basket. A net eventually replaced the basket but a hole in the net wasn't thought of until the early 1900's, making a ladder part of the necessary basketball equipment. 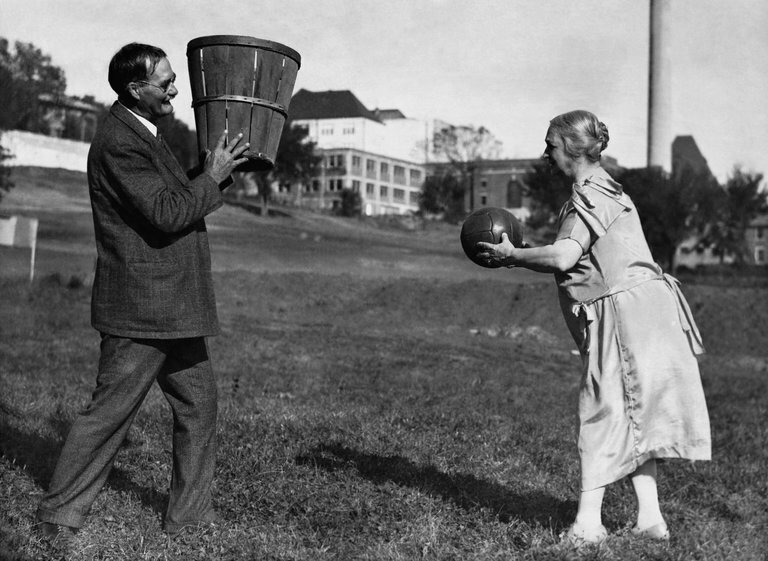 James Naismith, holding a fruit basket for his wife. Naismith became a doctor and a Presbyterian minister and took a position at Kansas University. He brought basketball with him and continued to advocate for exercise and clean living . . .
although he believed gymnastics and wrestling were the best sports for health. Harry Kersenbrock, from Nebraska, was recruited by the Kansas Jayhawks for the 1928 season. 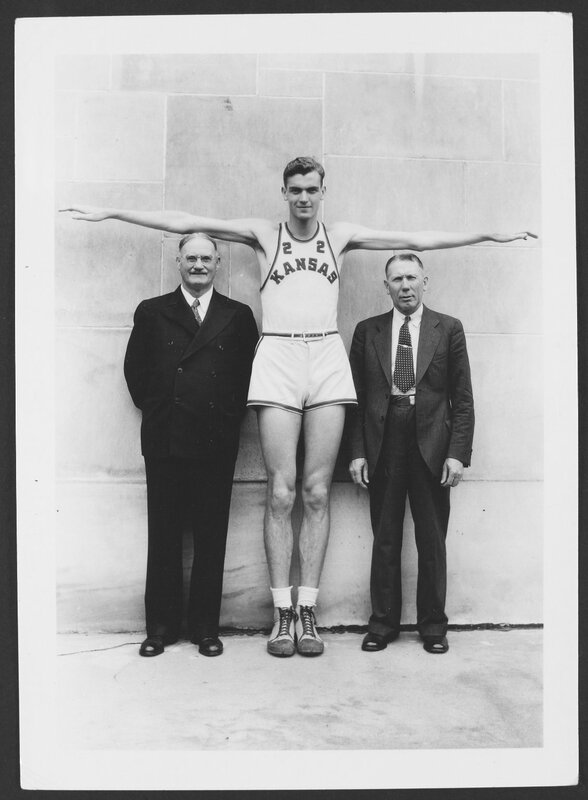 At 7 feet tall, he was by far the tallest player in the college system. Tragically, he drowned in a canoe accident before the season started. 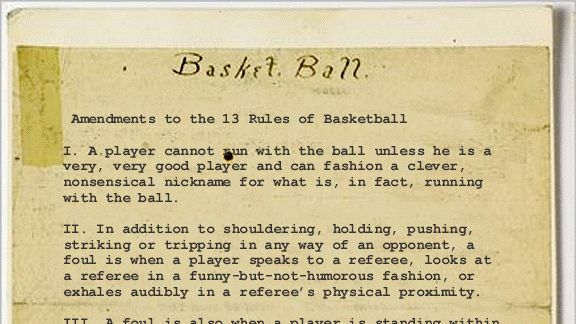 The original basketball rules were auctioned in 2010. A Kansas University graduate paid $4.3 million, more than double the estimated $2 million, and returned them to Kansas University. Basketball was a demonstration sport at the 1904 Olympics in St. Louis but didn't become an official event until the1936 Olympics in Berlin. That year it was played on an outdoor clay court which became a muddy pond during a rainstorm. The US won the gold. 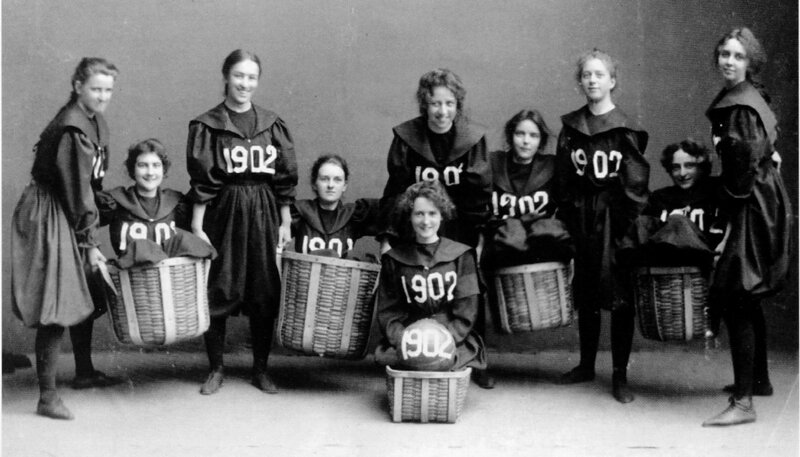 Smith College Class of 1902 girls basketball team. Professional and college groups were formed in the late 1930's, eventually creating an Olympic dilemma. 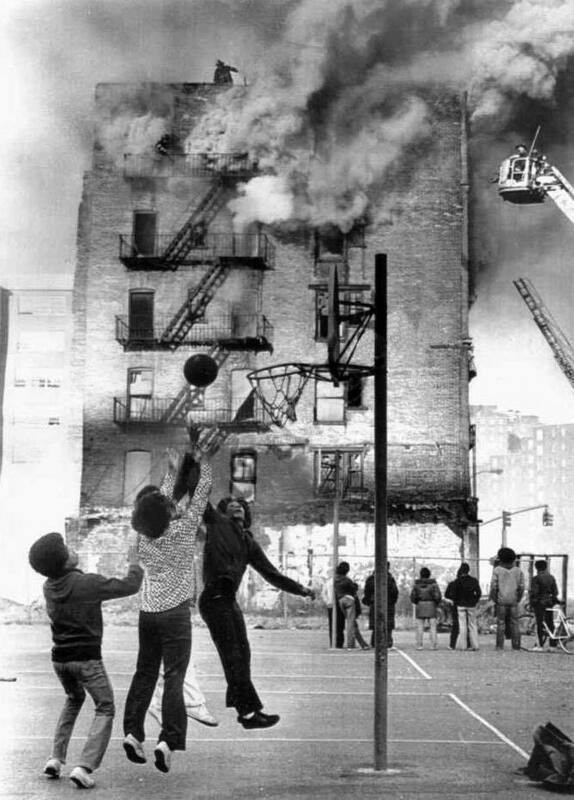 Boys ignore a 1975 apartment building fire while playing basketball in front of the blaze. 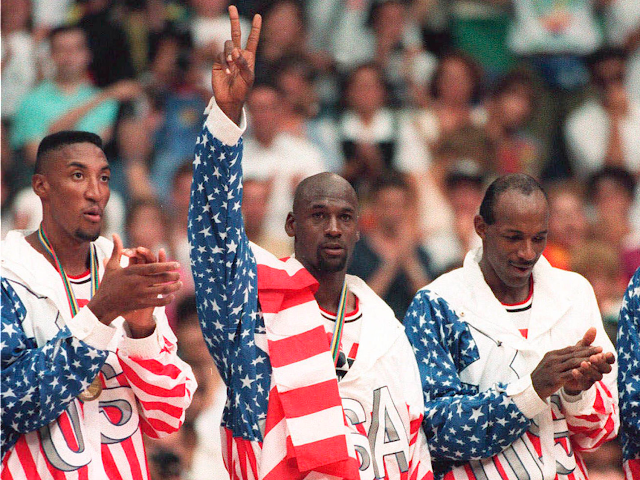 Because Olympians could not be professional athletes, the US teams did not include NBA players. 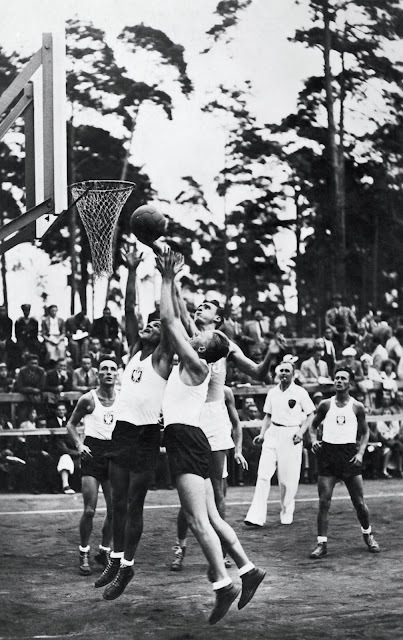 However, an abundance of American college and amateur athletes had won every basketball game they played during the first seven Olympic tournaments. The 1972 Summer Olympics in Munich, Germany. Going into the 1972 Olympic basketball final against Russia, the US overall Olympic record was 63 - 0. 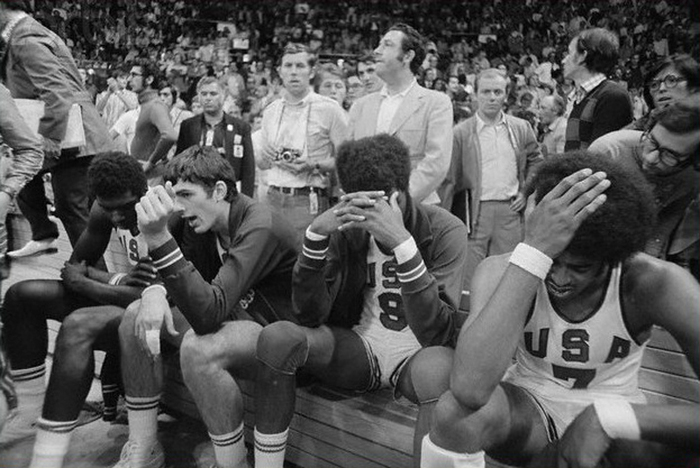 The final seconds of the final game caused an enormous controversy involving an argument over free throws and calls for a timeout. Ultimately, the Russians were declared the winners and the US team returned home after refused to accept the silver medal. 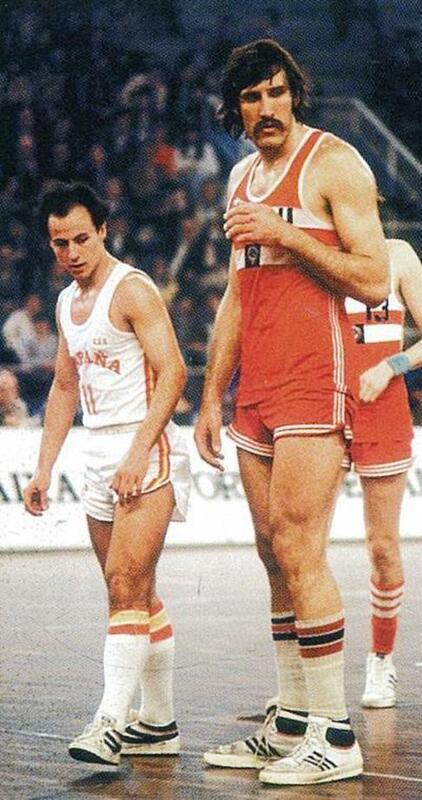 The Eastern Bloc countries had been trained state-sponsored "full-time amateur athletes". To counter, and to save the basketball-creating-country further embarrassment, the rules were modified over the objection of the Soviets. 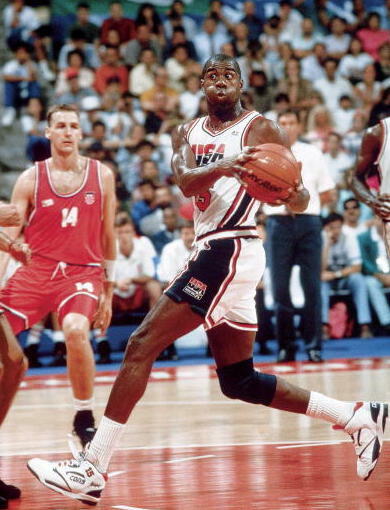 The 1992 US dream team included Michael Jordan, John Stockton, Karl Malone, Magic Johnson, Larry Bird, Patrick Ewing, and Charles Barkley. The team trained for the Olympics in Monaco for six days, practicing two hours a day.